Dr. Nu Lu is a hematologist oncologist who practices in Santa Clarita. She is board certified in hematology and medical oncology. 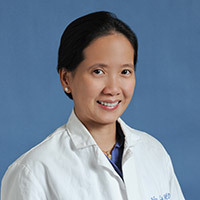 Dr. Lu received her medical degree from the John A. Burns School of Medicine in Honolulu, and completed internship and residency training in internal medicine at the University of Texas Southwestern Medical Center. Dr. Lu then moved to Los Angeles to complete a fellowship in hematology/oncology at the David Geffen School of Medicine at UCLA.